IFTTT is a godsend solution for people who use different services and platforms and wish they could make them work better together. The idea of tying triggers from one device to actions on another is especially practical in the smart home, and even more so when you can use Google Home to control all those devices through IFTTT even if they don't have direct Assistant integration - yet. With that said, IFTTT has just added support for 3 new products through new channels. 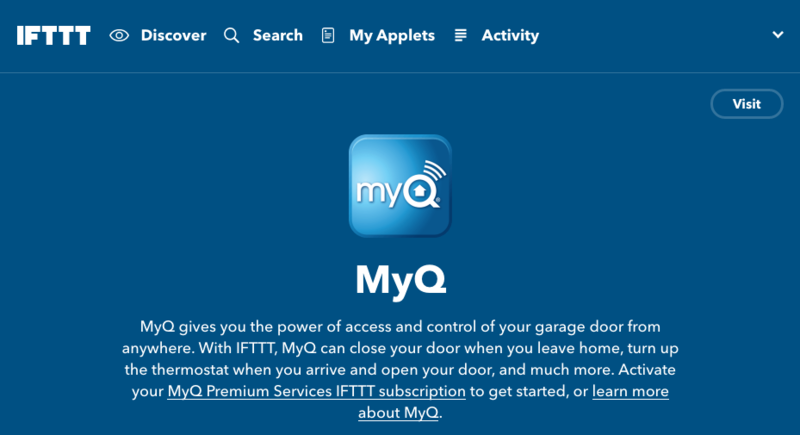 The first is the MyQ channel for the connected LiftMaster and Chamberlain MyQ garage door openers. The triggers are based on whether a door is opened or closed, and you only get closing the door as an action. That's understandable: you wouldn't want something to mistakenly trigger opening your garage door. LiftMaster and Chamberlain officially announced the IFTTT and Google Assistant integration, though they've been live for a while, and the pricing behind it. You'll have to pay $1/month or $10/year to be able to use these two services with your garage door, and there's a 30-day trial to see if it works for you before you start putting down money. The second channel is Neato for the Botvac Connected robot vacuum series. There are no triggers in this channel, but you can use other services to start, pause, resume, and stop cleaning, as well as dock the vacuum. And the third channel is for the newly announced My Cloud Home NAS by Western Digital. The aptly-named My Cloud Home channel only has one action and that's to save a file from a URL to the drive itself. It doesn't sound like much, but that should allow you to automatically save your Gmail attachments, Instagram photos, and even some security camera snapshots to your drive for safekeeping.